Receiving spam is like those telemarketers who call at dinner time, very annoying and you didn’t ask for it. Luckily you can stop this now with MailWasher. With over 8 million users, 22 languages and featured on both BBC World and CNN you can be confident that using MailWasher is one of the easiest ways to get rid of spam. I’ve used this in the past from giveaways, and found that it was well worth at least the price I paid for it…$0. It seems pretty good for it’s intended purpose, but as someone else mentioned, it cannot be used as a standalone email client. Seems like they should build this into Thunderbird or something, rather than making it an extra step you must do before reading your email. I would never pay the list price for this product, and probably not even a quarter of that, although I’m a cheapskate. I haven’t decided if I’ll take it this time or not. The thing is, you need to spend some time and effort training it, then after your 1-year trial, you need to buy it if you want to keep using it. I have been using the free version for a long time, and it works fine for me. The difference between the free version and the paid version is that the free version only supports one account. As I only have one, that is not a problem. I do agree that the license fee is high, but if you have multiple accounts with significant span, it would be a good investment. Thanks for this program! Have been using it for some time and like it a lot, especially the bounce-feature, but also the chance of removing before all the junk gets to my pc. Pity indeed that it is getting a bit expensive, so this gift is much appreciated. Have you ever been annoyed by your inbox being filled with junk and spam mail everyday? Is the SPAM, SCAMS and OTHER JUNK mails driving you crazy? Have you ever wished there was a solution to this problem? Luckily, MailWasher Pro is the solution to this problem. 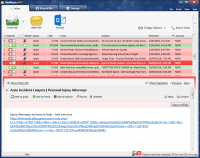 MailWasher Pro is an anti-spam software, which seems to do it’s work effeciently. It is a unique tool that will help you stop SPAM, SCAMS and OTHER JUNK mails before they get to you computer. It makes it possible to screen all your email accounts in one place and allow only the mail that you want to see in your inbox. MailWasher Pro enables the users to instantly delete any unwanted or suspicious email before they get to your computer or mobile device. This helps user avoid any email viruses in their PC and other devices. When started for the first time, MailWasher Pro scans for the email accounts on your computer if you have any. It automatically imports settings from email clients and contact lists too. As soon as this information is obtained the MailWasher Pro is ready to start detecting and removing spam. The simple and organized user interface makes this software easy to use for everyone including novices. When you press the ‘Check Mail’ button it scans your email account quickly and displays a list of emails with different marked statuses like Spam, Blacklist, Good, and Friend. You can choose and untick any email that you want to keep or tick the ones you want to delete. After doing this, all you have to do is click the ‘Wash Mail’ button and the spam email is gone forever and never downloaded to you PC or any of your devices. 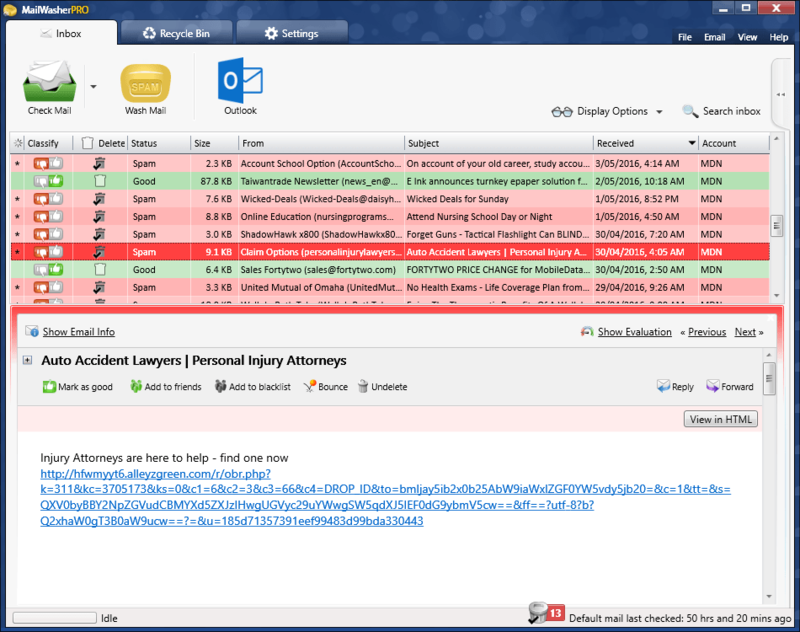 MailWasher Pro makes, deleting tons of spam, an easy process that anyone can carry out within a few seconds. Spam Tools– Spam tools are smart enough to do all the work for you and choose and highlight spam mail effectively. You can list an email as good or bad in just one click. Gets better over time– As you keep using it on daily basis the spam filters become more and more intelligent and effective than ever. This shows how effectively the software learns from you choices. Bounce Feature– is a tool which bounces an email back to the sender that indicates your email address no longer exists. If the sender receives your bounced message, they should take you off their email list and not send you any more email. Change how it looks– You can change colors, text size, placements of elements and other basic costumization. Multilingual support– It supports almost all major languages like English, German, French, Spanish, Polish, Dutch, Hungarian, Bulgarian, Ukranian, Swedish, Russian, Czech, Norwegian, Armenian, Croatian, Danish, Japanese, Portuguese, Italian, Chinese (Traditional and Simplified). A bit pricey!– Almost $40 for a year may be too much for a large group of users. Windows PC only– Not available for the MAC OSX users. Bounce Feature– This is more likely to help against companies who regularly clean their lists, but more often than not, will not work for spammers who mostly use fake email addresses. Simple UI– Makes it suitable for use by anyone. This makes it easy to set up and easy to use. Some customization– Changing colors, text size, placements of elements makes it a bit more user friendly and enhances the user experience. MailWasher Pro is easy, fast and blocks almost every unwanted email from your account. It is is a highly effective anti-spam filter; it is also easy to use. Not only does it work with all e-mail clients, it requires very minimal configuration. MailWasher Pro is a remarkably efficient spam filter application; there’s a gain in using it even if you have to run basically two software to get your emails. Used it for several years until it got to be a bit pricey. Does what it says but, I find that if I am careful with my mail, I don’t need it on my primary email. Always use a secondary email address for what I think will be junk.